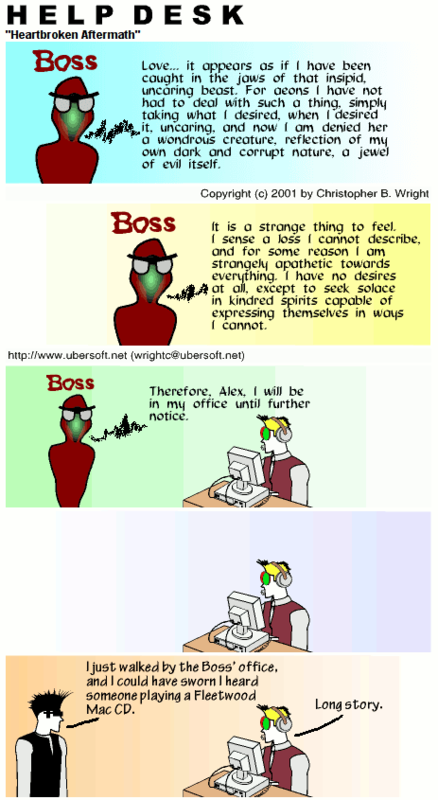 BOSS: Love… it appears as if I have been caught in the jaws of that insipid, uncaring beast. For aeons I have not had to deal with such a thing, simply taking what I desired, when I desired it, uncaring, and now I am denied her… a wondrous creature, reflection of my own dark and corrupt nature, a jewel of evil itself. BOSS: It is a strange thing to feel. I sense a loss I cannot describe, and for some reason I am strangely apathetic towards everything. I have no desires at all, except to seek solace in kindred spirits capable of expressing themselves in ways I cannot. BOSS: Therefore, Alex, I will be in my office until further notice. MARK: I just walked by the Boss’ office, and I could have sworn I heard someone playing a Fleetwood Mac CD.